In 2017, the University of Michigan celebrated its bicentennial. 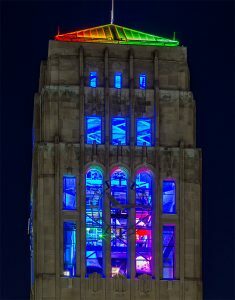 As part of the celebration, a $1 million fund was created to install, operate, and maintain new color changing LED lighting inside of the historic Burton Memorial Tower. Philadelphia’s The Lighting Practice (TLP), known for working on the Empire State Building and the U.S. Capitol Dome, was the designer. Working hand-in-hand with TLP, Huron Valley Electric (HVE) completed the installation of this unique project. After removing the outmoded floodlights that had illuminated the tower from outside, HVE installed, aimed, and programmed new LEDs. More than 1,200 light emitting diodes (LEDs) were installed inside of the bell chamber. 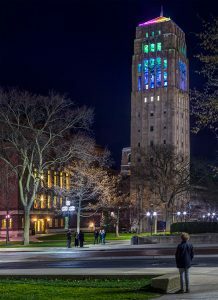 As a result, the new lighting system creates a subtle glow within the tower highlighting the Baird Carillon bells and the top openings. The system can also illuminate the bells and tower in a spectrum of colors and provide theatrical effects and animations. 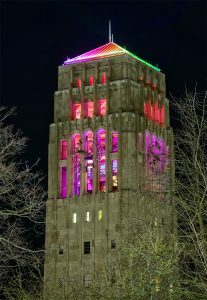 The Burton Tower and Baird Carillon on Central Campus has long been the most memorable sites on the university campus. In his 1921 commencement address, University President Leroy Burton suggested the erection of a tower. This would serve as a memorial to the 236 University of Michigan men who lost their lives in World War I. That proposal failed to meet with general approval. After Burton’s death in 1925, erection of the campanile and chimes that Burton had hoped for was suggested. While this idea found immediate favor with the alumni and plans for a campaign were formulated. Due to the onset of the depression, the plan was temporarily abandoned. Finally, the 1935 gift of the 43-ton, 53 bell carillon by Charles Baird, U-M’s first athletic director, consequently revived the matter. It was determined that the proposed tower should be practical as well as aesthetic. Otherwise, university funds could not be used for its construction. Moreover, it was to be built near the center of the developing campus and the proposed School of Music building since the classrooms in the tower were to be used by that school. These considerations resulted in the eventual choice of the site adjacent to Hill Auditorium. Most noteworthy, the 212-foot-tall Burton Memorial Tower was designed by renowned architect Albert Kahn. It was erected during the 1935-36 school year and constructed as a reinforced concrete shell faced with Indiana limestone. Long shallow buttresses extending to the top emphasize its height. The Tower is 41-feet 7-inches square and contains a basement and ten floors with 19,848 sq. ft. of floor space. Seven stories contain 40 classrooms, practice rooms, and a divisional music library, all utilized by the School of Music. Inscribed on the entry walls are the names of the alumni and friends of the University who contributed to the project. The tenth floor, where the bells are housed, was designed to provide a visitor overlook of the surrounding terrain. Above all, a terrace between the outer and inner screens protecting the bells and the playing mechanism provides a viewing spot. The floor of the bell chamber is 120 feet from the ground and 40 feet high. There is an observation floor above the bell chamber. The final cost of the Tower was $243,664.61. The relighting project was first showcased at the University’s 2017 spring bicentennial “True Blue” celebration. As a result, the lighting display will be utilized for future graduations, game days, and other special events. The project, which was entirely donor funded, is part of the university’s Victors for Michigan campaign.